Game Bros. LIVE! gives a comedian's perspective unto the world of video games. 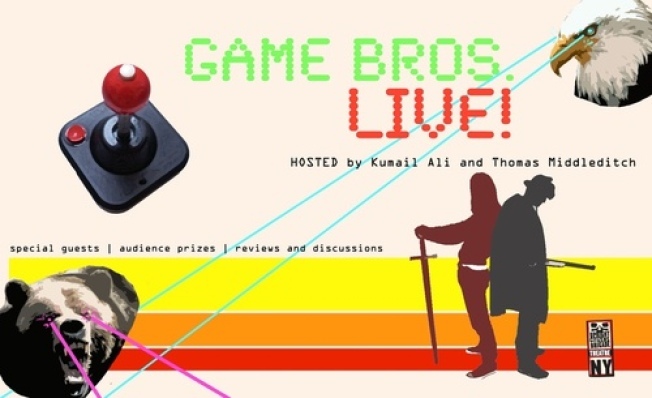 This upcoming Saturday at UCB Theatre, Timmy Williams and Sam Brown of The Whitest Kids U Know join with Kumail Nanjiani and Thomas Middleditch for Game Bros. Live!, a monthly show about the culture of video games. Topics to be covered this time around include the post-Nuclear apocalypse game Fallout 3, stupid powerups, and "obscure kungfu movie clips that will blow your gamer mind right out of your gamer ..." well, mind, all viewed through the eyes of a couple crooked local comedians. From the listing: "Game Bros. Live! embraces the world of video game culture by reviewing new games, conquering games from our childhoods, geeking out on new technology, and mocking every bit of it. Expect plenty of live banter, laughs, videos, interviews with guests who are involved/obsessed with video games, and Marble Madness challenges in each show!" Oh, and they're charming enough to entertain your girlfriend, too. To reserve your tickets, visit the UCB Theatre online, and keep up to speed with the Game Bros. boys through their Facebook page.